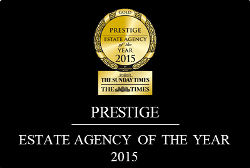 pa black, the exclusive homes service from Peter Alan, has been awarded The Sunday Times Estate Agency of the Year Award for Prestige Estate Agency. pa black received the accolade on Friday 4 December, at The Lancaster London Hotel at The Estate Agency of the Year Awards, held in association with The Sunday Times and The Times. The winners were presented with their awards by Matt Dawson international rugby star and MBE, with renowned journalist, author and newsreader Penny Smith acting as compere. pa black is a powerful brand, with a clear focus on quality and distinction, which is now recognised for selling properties in the upper-end of the Welsh market. The brand was launched in 2011 following extensive research which identified that whilst there was growth in the Welsh premium property marker there wasn’t a dedicated prestige service. Now in its thirteenth year as a dedicated competition, these awards have become widely recognised as the most prestigious and difficult to win. With more entrants than ever before, over 5,000 offices were represented this year, but only the very best of the best were crowned as winners.